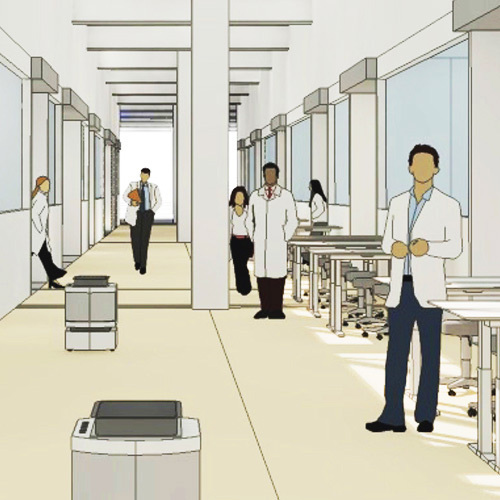 Northwell Health is moving closer to establishing new core testing facilities with the groundbreaking of The Core Lab New York (CLNY), a 36,000-square-foot building located on Little Neck Parkway in the borough of Queens. The complement to a chemistry-based core testing lab under development inside a 1 million-square-foot building that houses Northwell's Center for Advanced Medicine in nearby Lake Success, the CLNY will function as the health system's immediate connection to New York City and pair with the Lake Success facility to enhance performance while lowering costs, system-wide. The Little Neck building is to be shared with NYC Health + Hospitals, a major part of the Clinical Laboratory of New York Alliance, which was formed with the purpose of consolidating the two systems' lab operations. As with Northwell's other core lab project, CLNY is scheduled to be completed in mid-2018, with both utilizing automated workflow and testing systems in order to process the huge number of tests that each system performs. The Northwell Laboratories network currently performs more than 30 million tests each year, and NYC Health + Hospitals 15 million. When the lab opens, it will be the largest, non-profit, hospital-oriented lab network in the nation. The Clinical Laboratory of New York Alliance estimates that the consolidation of lab functions will lead to savings of $30 million annually.